Asklepieion was built around 400 BC, after the death of the father of modern medicine Hippocrates. It is located on a hill around 4 km from Kos town and it is surrounded by a forest which by that time was considered to be a holy place. It consists of three levels which are joined together with a restored marble staircase (you can see parts of the ancient stair). On the lowest level there was a medical school where medical knowledge was being taught. It also had some visitors’ rooms for offerings and waiting for patients and their families. There is a small fountain on one of the restored niches. The water runs into a tank and through a small canal, to the fields surrounding the Asklepieion. 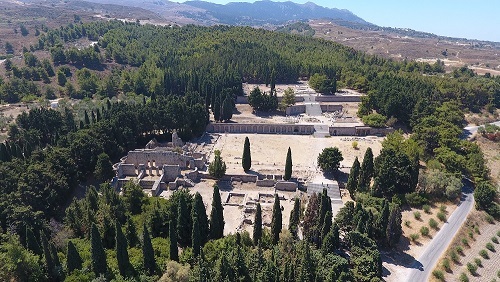 This level also had a medical center where hydrotherapy was used in thermal baths where a complicated piping system provided it with pure water rich in salts, magnesium and minerals from Kos mountain springs. On the second level were the temples. In the middle are the remains of a temple dated to the 3rd century BC. Many clay offerings were found there during the excavations. To the west there is a small Asclepius temple. In this temple, there were the statues of Asclepius and Hygeia, and an opening lined with marble which was used from patients and visitors to drop their offerings into it. At the left side there are still standing some restored columns belonging to the Temple of Apollo. On the third level there are the remains of a large temple dedicated to Asclepius. In the south side of the colonnade there is a staircase leading to the sacred forest. During the Christian times a small church of the “Panayia tou Tarsou”, was build the altar of which still survives. In the three sides of the terrace were porticoes, on which houses were built later. From this level you can have a panoramic view of Kos and almost all the eastern part of the island.